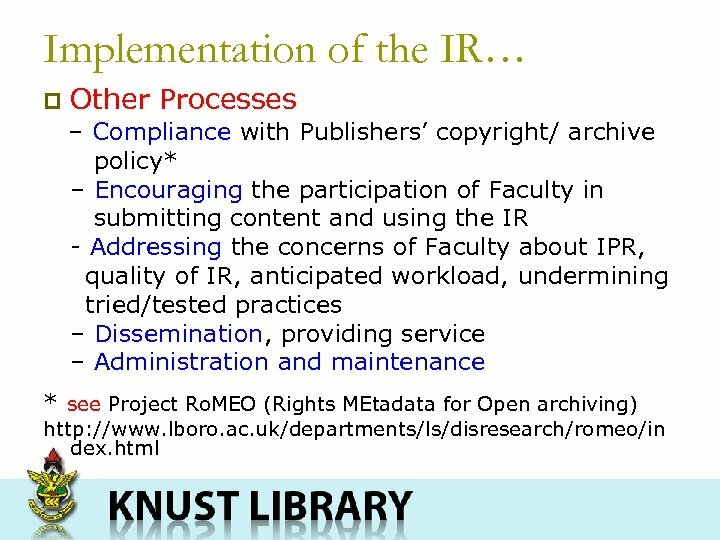 INTRODUCTION p p p Open Access (OA)is subject of discussions in recent times among stakeholders. 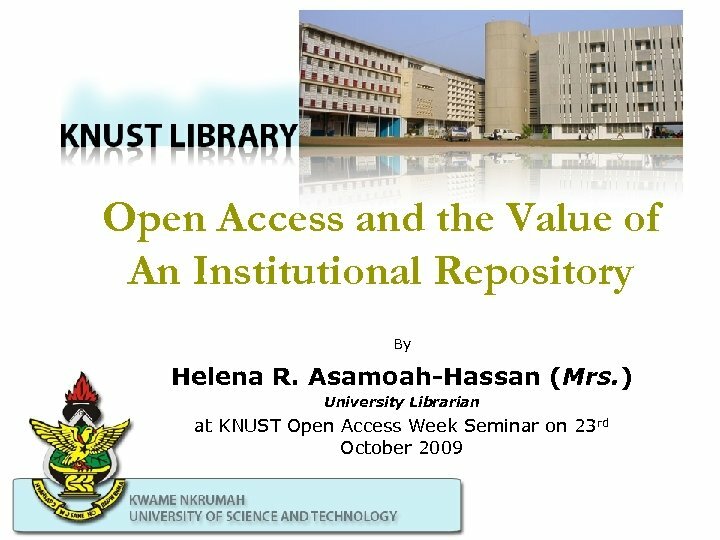 OA has come in to save the situation of lack of scholarly information in libraries –high cost journals and reduced budgets of libraries. Currently about 10% of peer reviewed journals are OA journals. However OA is seen by some as economically unsustainable, whilst others do not agree. 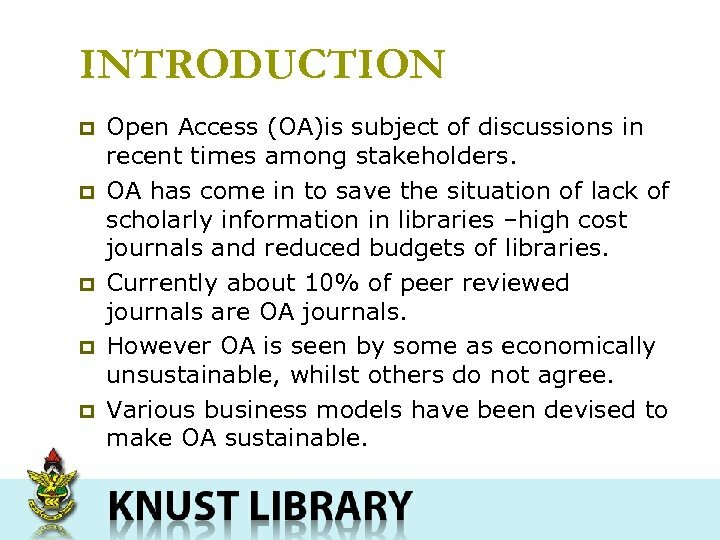 Various business models have been devised to make OA sustainable. Why Open Access (OA)Journals This is as a result of dissatisfaction by : p Academics/Authors that their work is not seen by all their peers – do not receive the recognition they deserve. p Readers who cannot view all research literature they need – less effective. 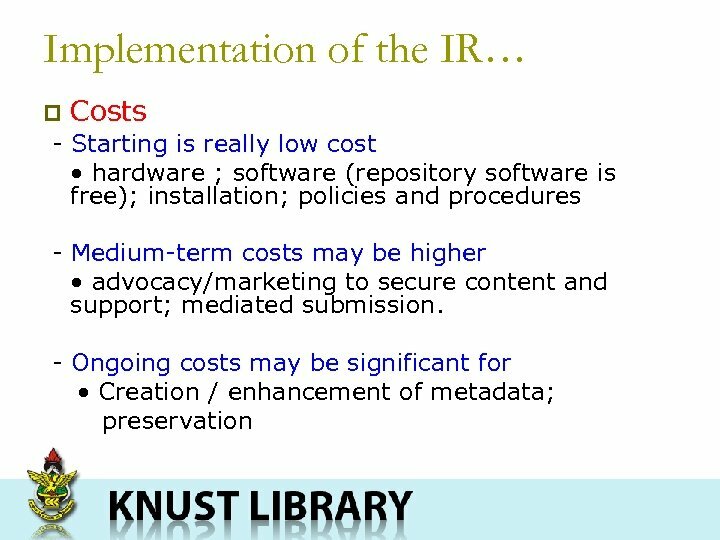 p Libraries that cannot satisfy information needs of their users as cost of acquiring journals are going beyond their budget. 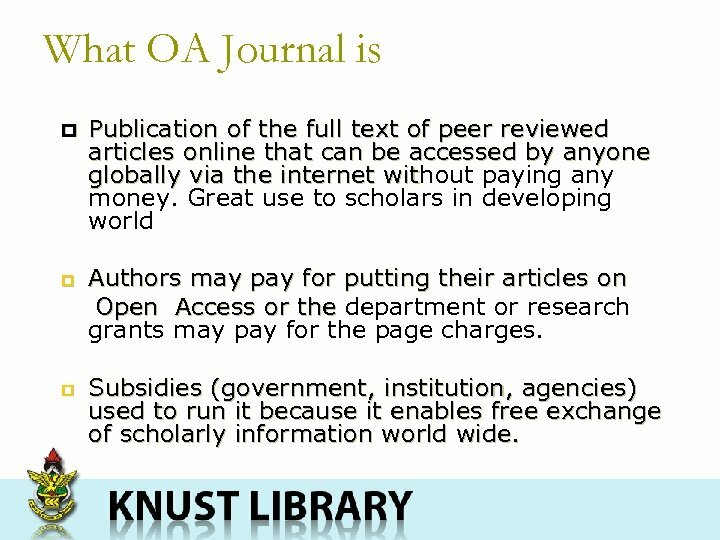 What OA Journal is p p p Publication of the full text of peer reviewed articles online that can be accessed by anyone globally via the internet without paying any wit money. 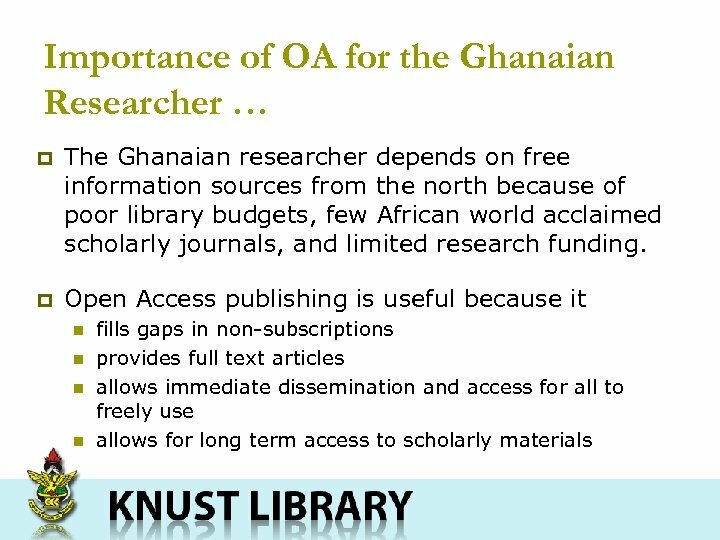 Great use to scholars in developing world Authors may pay for putting their articles on Open Access or the department or research grants may pay for the page charges. 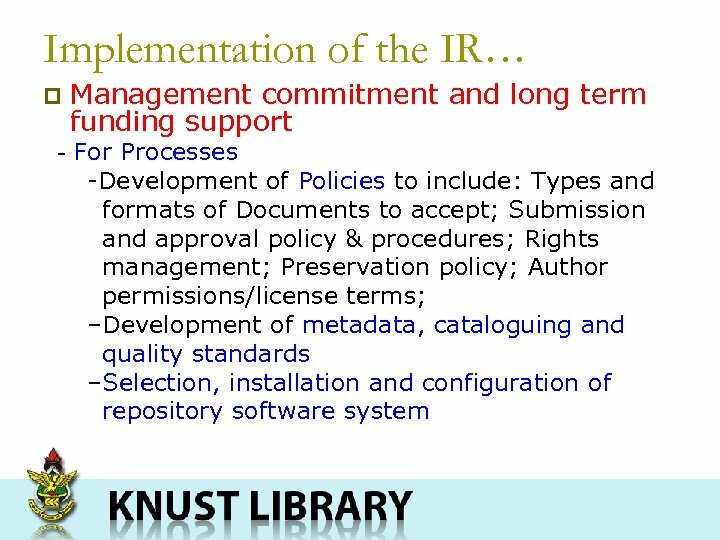 Subsidies (government, institution, agencies) used to run it because it enables free exchange of scholarly information world wide. 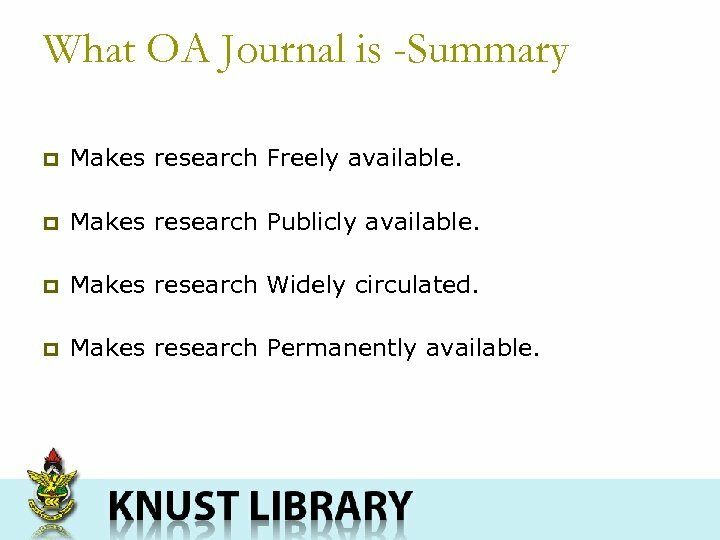 What OA Journal is -Summary p Makes research Freely available. p Makes research Publicly available. p Makes research Widely circulated. 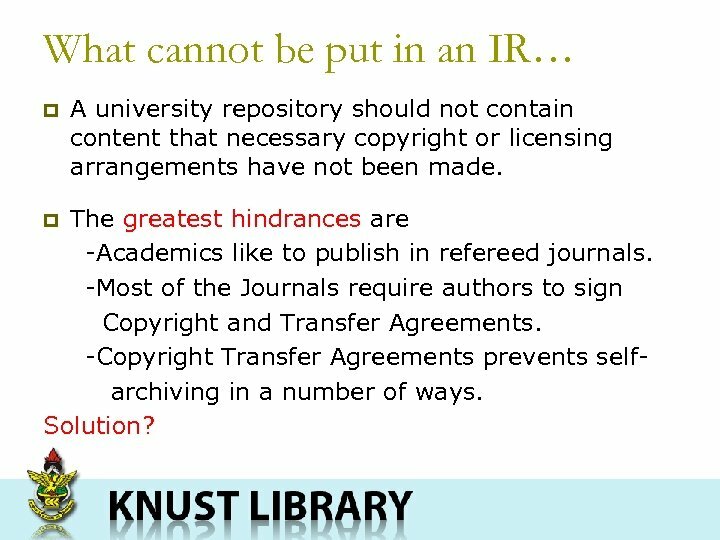 p Makes research Permanently available. 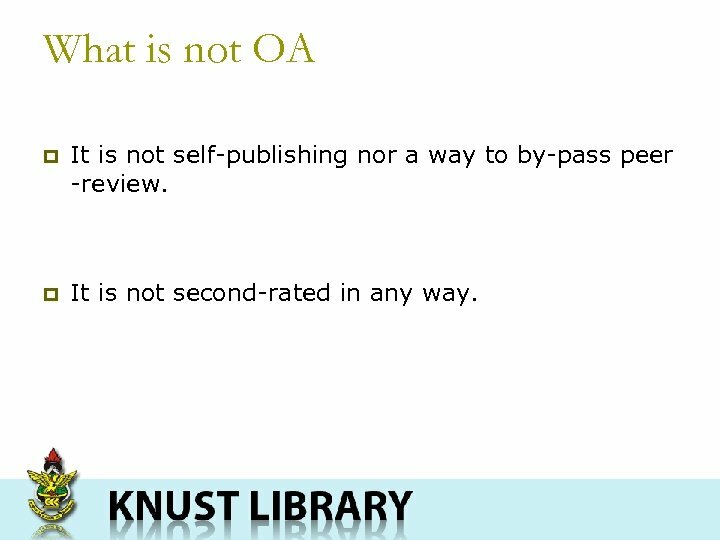 What is not OA p It is not self-publishing nor a way to by-pass peer -review. p It is not second-rated in any way. 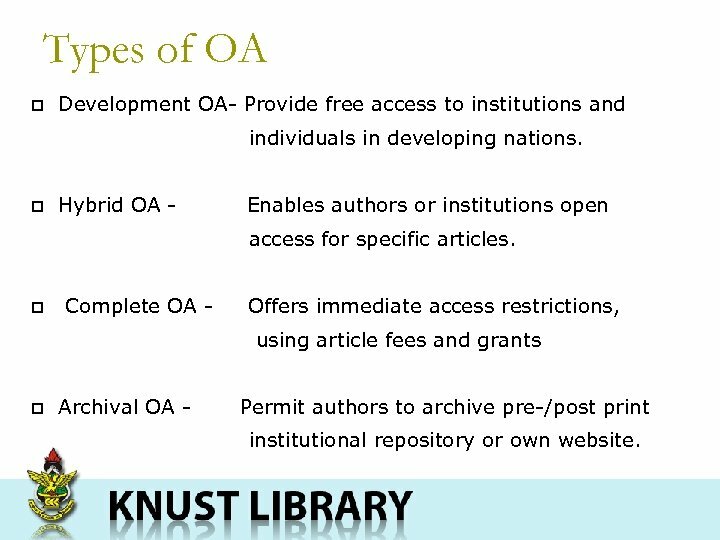 Types of OA p Development OA- Provide free access to institutions and individuals in developing nations. 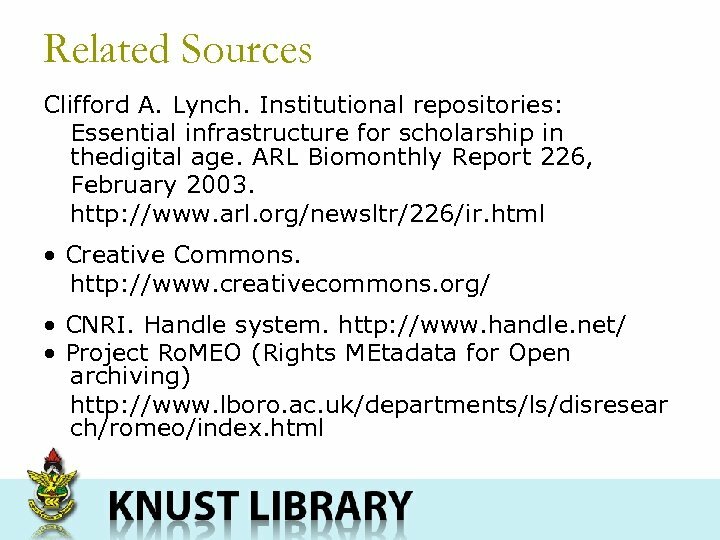 p Hybrid OA - Enables authors or institutions open access for specific articles. 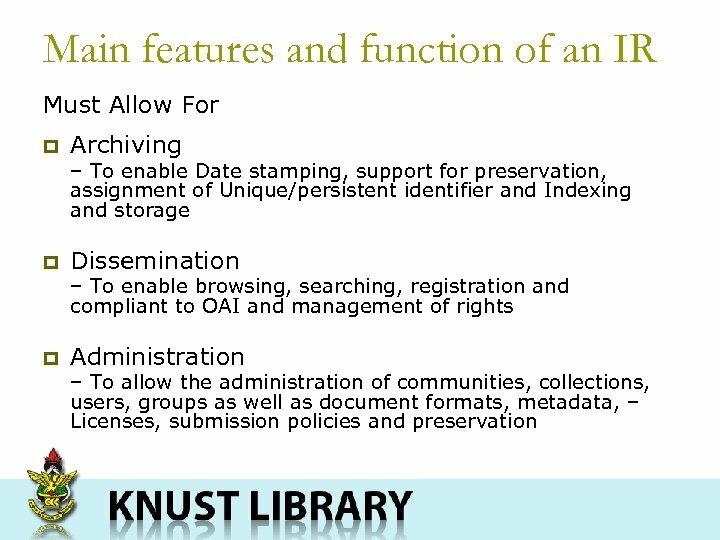 p Complete OA - Offers immediate access restrictions, using article fees and grants p Archival OA - Permit authors to archive pre-/post print institutional repository or own website. 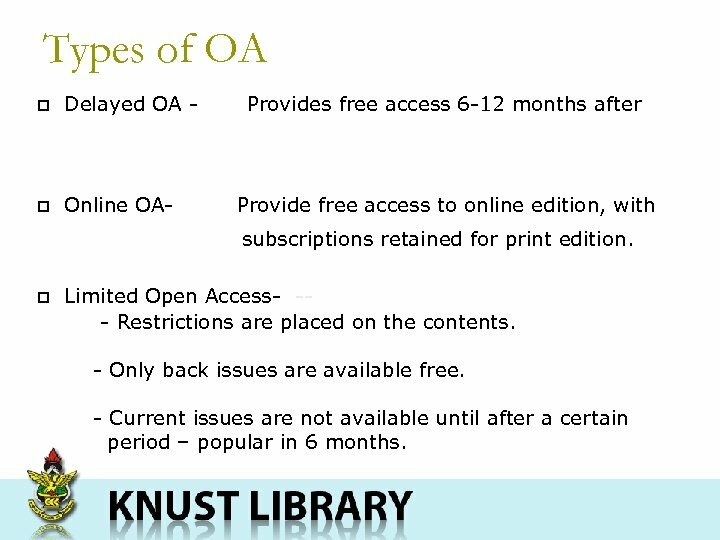 Types of OA p Delayed OA - p Online OA- Provides free access 6 -12 months after Provide free access to online edition, with subscriptions retained for print edition. p Limited Open Access- -- Restrictions are placed on the contents. - Only back issues are available free. - Current issues are not available until after a certain period – popular in 6 months. 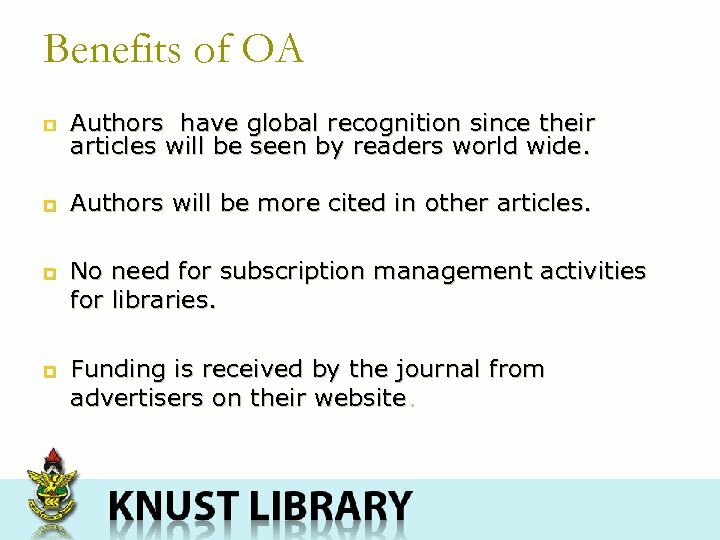 Benefits of OA p Authors have global recognition since their articles will be seen by readers world wide. p Authors will be more cited in other articles. p p No need for subscription management activities for libraries. Funding is received by the journal from advertisers on their website. 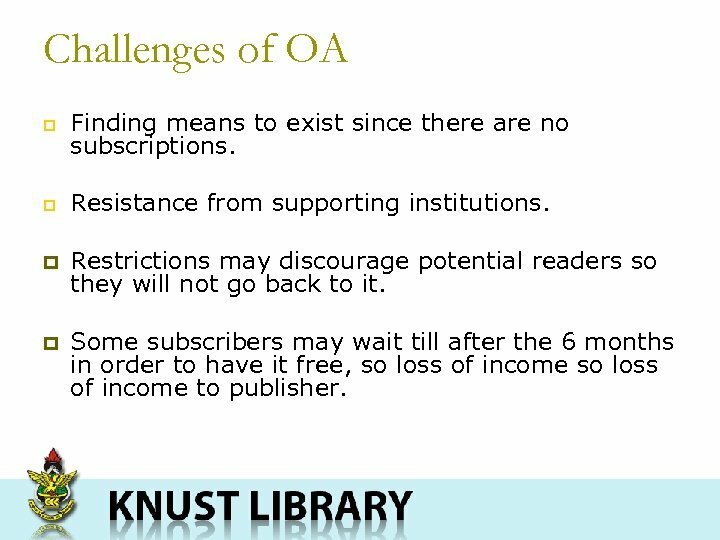 Challenges of OA p Finding means to exist since there are no subscriptions. p Resistance from supporting institutions. p Restrictions may discourage potential readers so they will not go back to it. p Some subscribers may wait till after the 6 months in order to have it free, so loss of income to publisher. 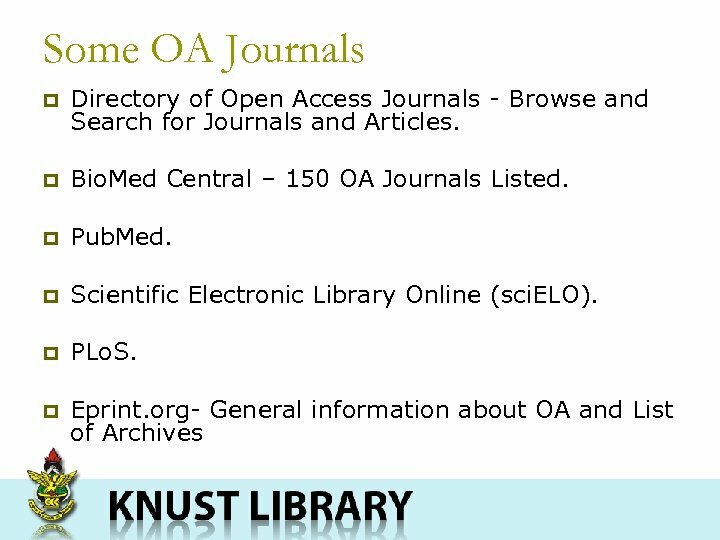 Directory of Open Access Journals (DOAJ) p DOAJ - www. doaj. 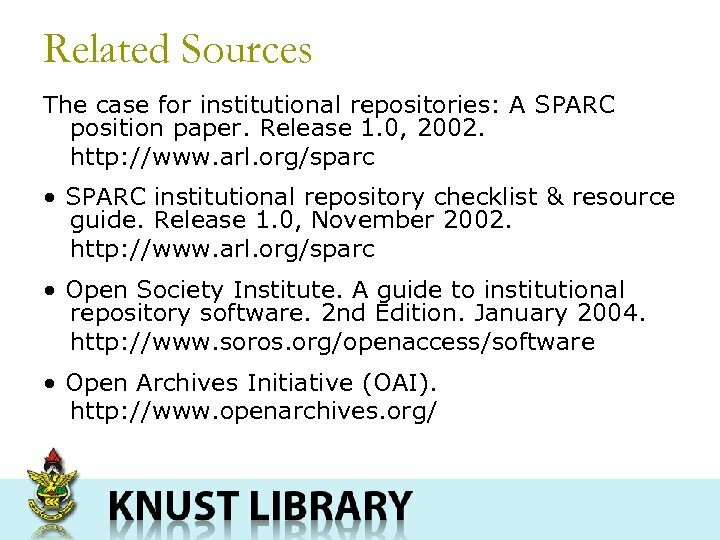 org - An indexing service for OA journals. - This service covers free, full text, quality controlled scientific and scholarly journals. 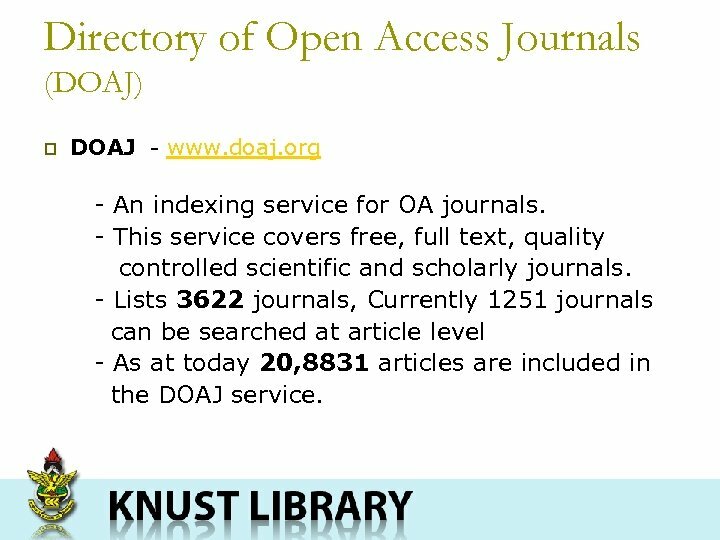 - Lists 3622 journals, Currently 1251 journals can be searched at article level - As at today 20, 8831 articles are included in the DOAJ service. 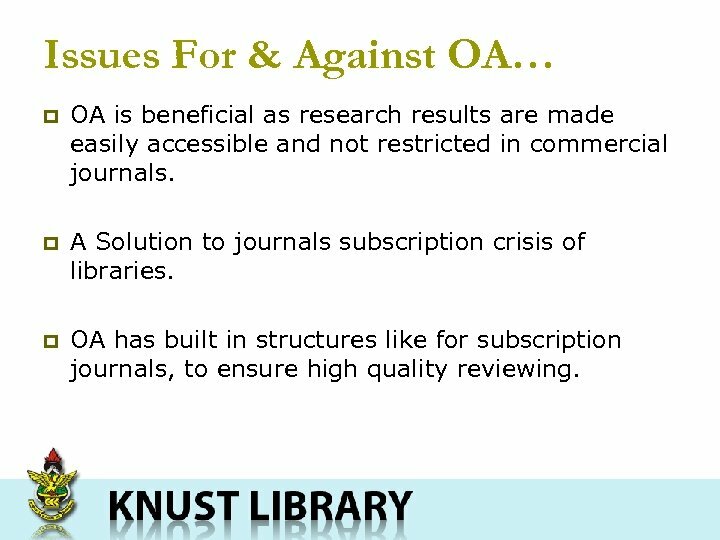 Issues For & Against OA… p OA is beneficial as research results are made easily accessible and not restricted in commercial journals. p A Solution to journals subscription crisis of libraries. p OA has built in structures like for subscription journals, to ensure high quality reviewing. 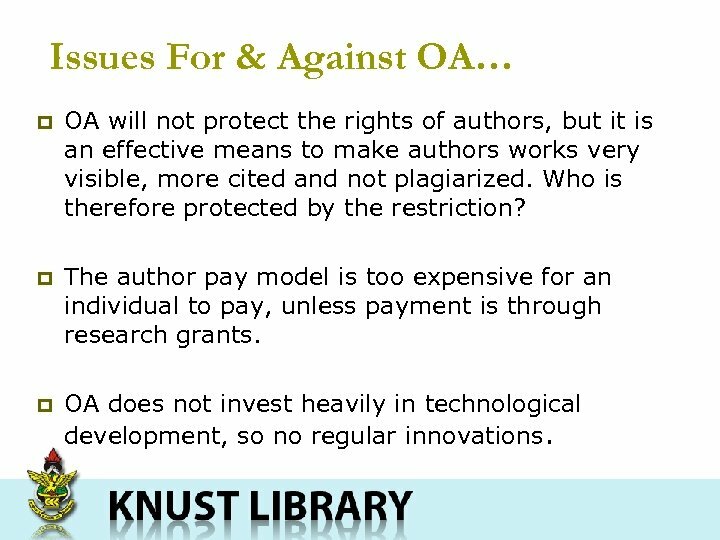 Issues For & Against OA… p OA will not protect the rights of authors, but it is an effective means to make authors works very visible, more cited and not plagiarized. Who is therefore protected by the restriction? p The author pay model is too expensive for an individual to pay, unless payment is through research grants. p OA does not invest heavily in technological development, so no regular innovations. 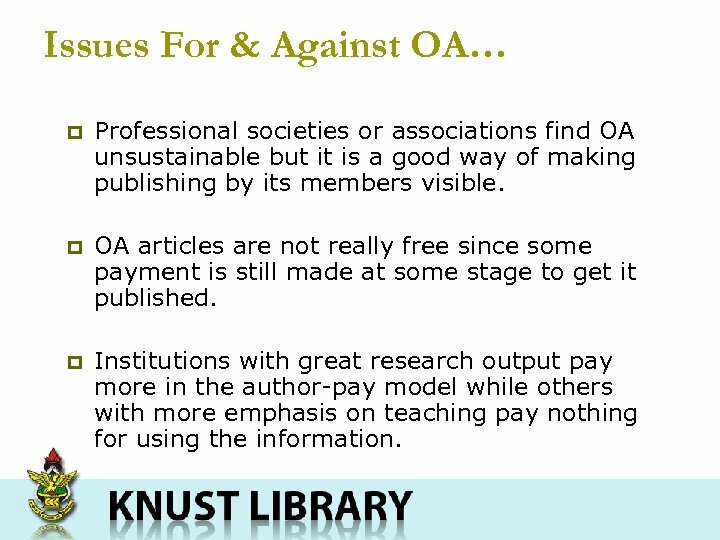 Issues For & Against OA… p Professional societies or associations find OA unsustainable but it is a good way of making publishing by its members visible. p OA articles are not really free since some payment is still made at some stage to get it published. p Institutions with great research output pay more in the author-pay model while others with more emphasis on teaching pay nothing for using the information. 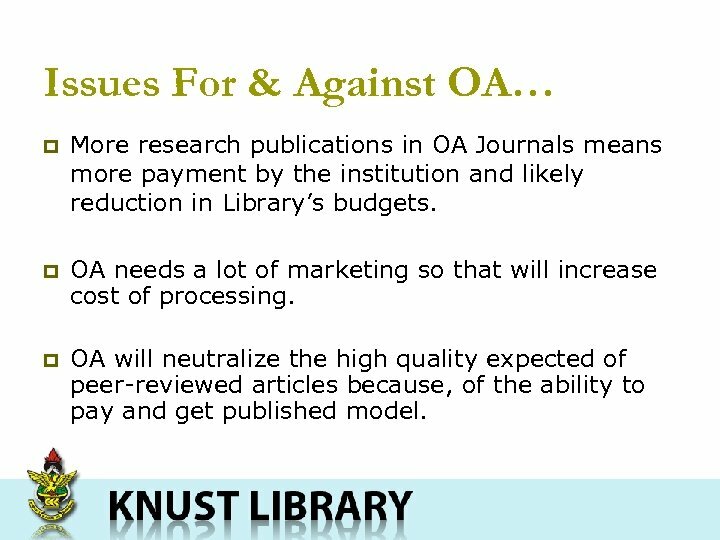 Issues For & Against OA… p More research publications in OA Journals means more payment by the institution and likely reduction in Library’s budgets. p OA needs a lot of marketing so that will increase cost of processing. p OA will neutralize the high quality expected of peer-reviewed articles because, of the ability to pay and get published model. 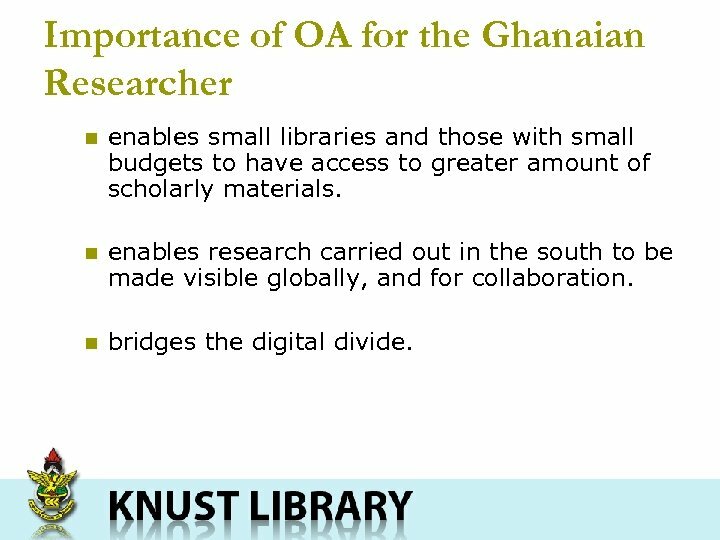 Importance of OA for the Ghanaian Researcher n enables small libraries and those with small budgets to have access to greater amount of scholarly materials. n enables research carried out in the south to be made visible globally, and for collaboration. n bridges the digital divide. 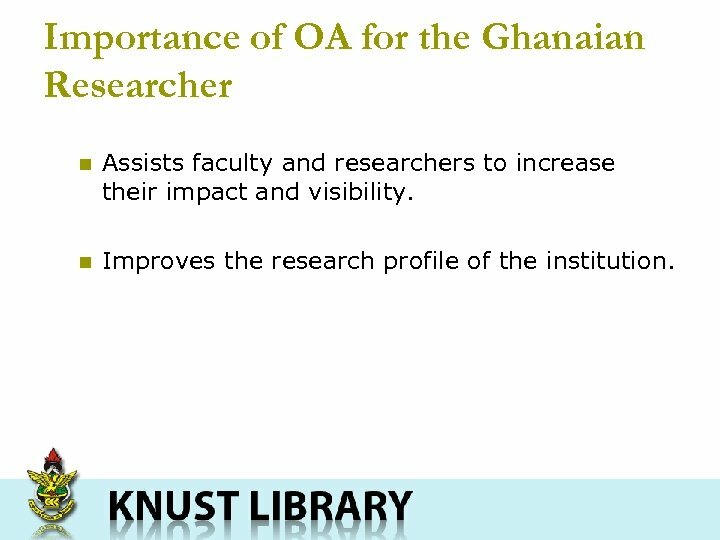 Importance of OA for the Ghanaian Researcher n Assists faculty and researchers to increase their impact and visibility. 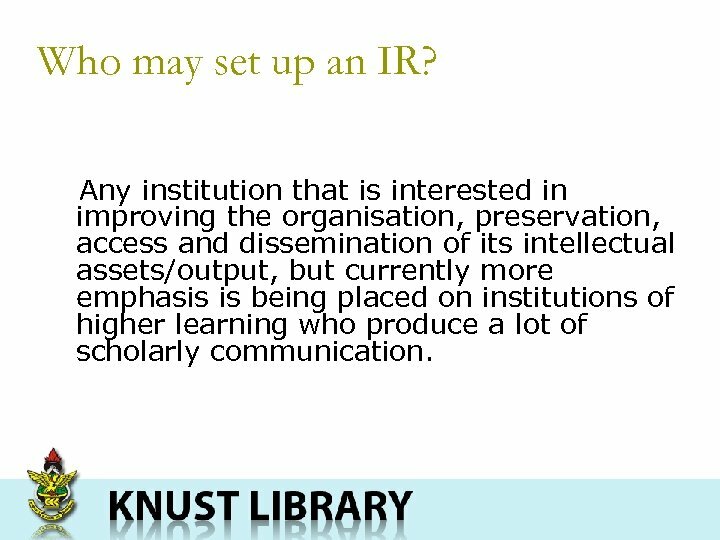 n Improves the research profile of the institution. 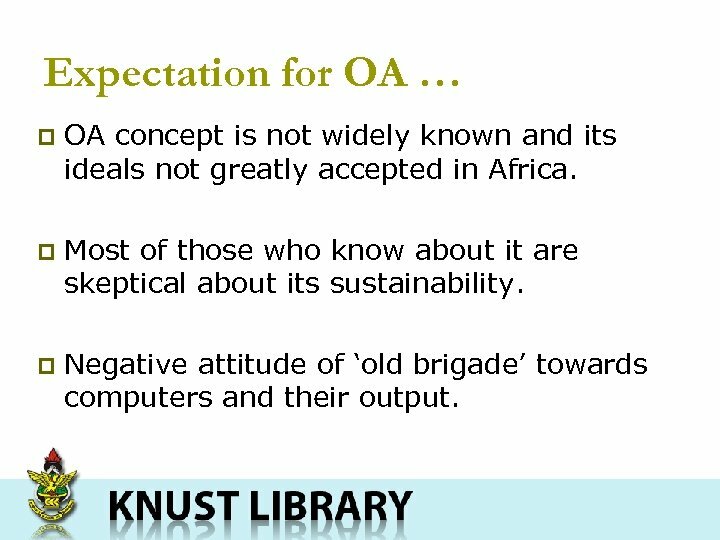 Expectation for OA … p OA concept is not widely known and its ideals not greatly accepted in Africa. p Most of those who know about it are skeptical about its sustainability. p Negative attitude of ‘old brigade’ towards computers and their output. 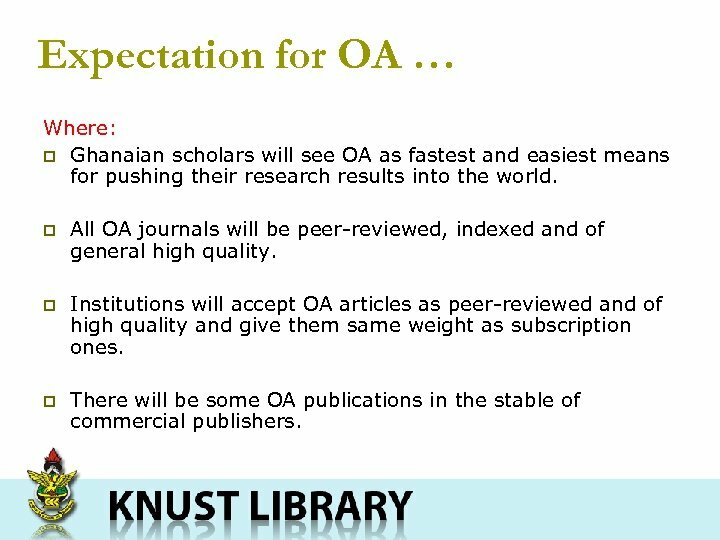 Expectation for OA … Where: p Ghanaian scholars will see OA as fastest and easiest means for pushing their research results into the world. p All OA journals will be peer-reviewed, indexed and of general high quality. p Institutions will accept OA articles as peer-reviewed and of high quality and give them same weight as subscription ones. p There will be some OA publications in the stable of commercial publishers. 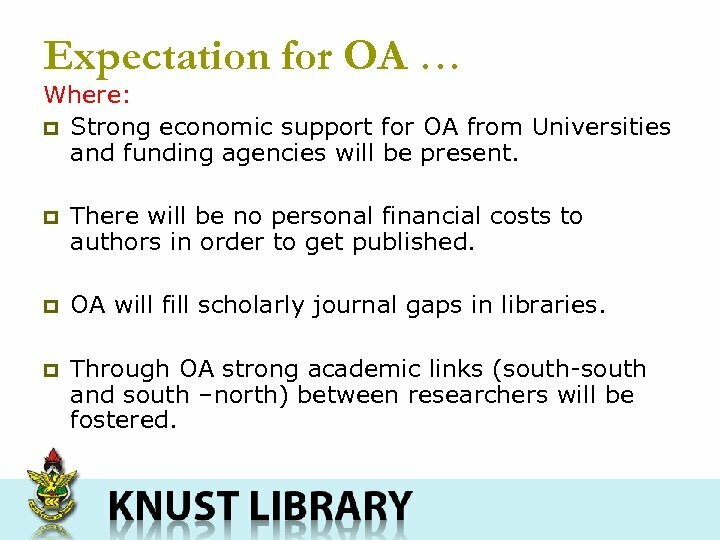 Expectation for OA … Where: p Strong economic support for OA from Universities and funding agencies will be present. p There will be no personal financial costs to authors in order to get published. 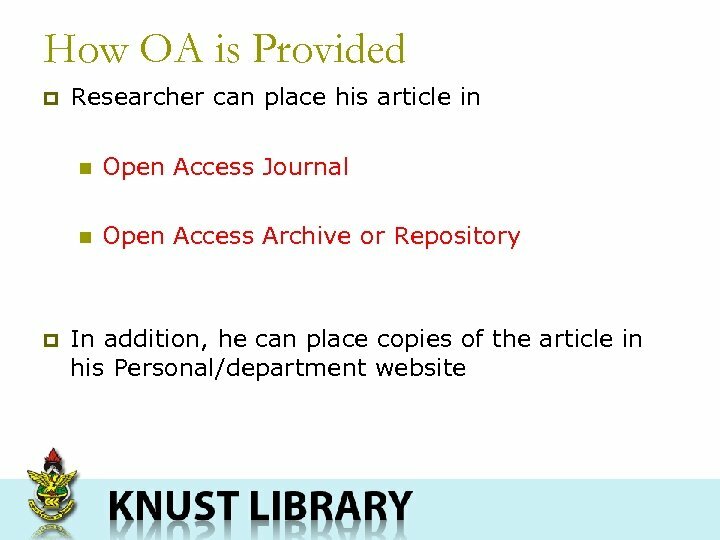 p OA will fill scholarly journal gaps in libraries. p Through OA strong academic links (south-south and south –north) between researchers will be fostered. 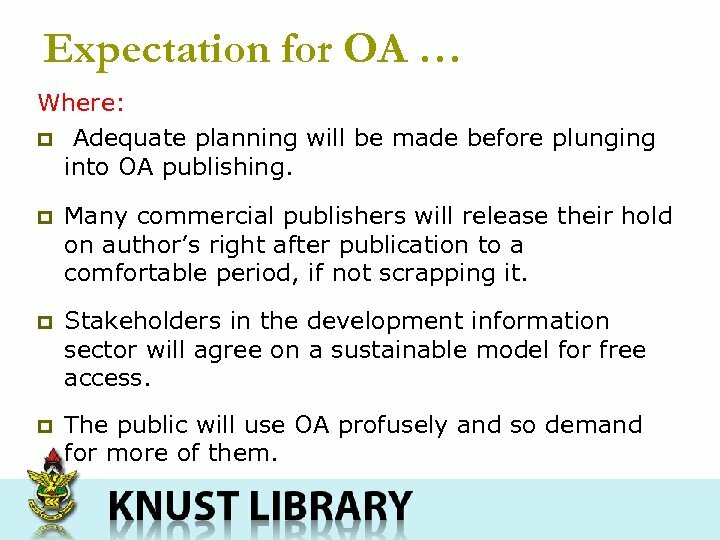 Expectation for OA … Where: p Adequate planning will be made before plunging into OA publishing. p Many commercial publishers will release their hold on author’s right after publication to a comfortable period, if not scrapping it. p Stakeholders in the development information sector will agree on a sustainable model for free access. p The public will use OA profusely and so demand for more of them. Expectation for OA … Where: p Companies/Industries will fund OA journals to enable researchers with high quality material but no funding to publish. p African Institutions will develop their own OSS for their OA journals having in mind their indigenous languages and materials. 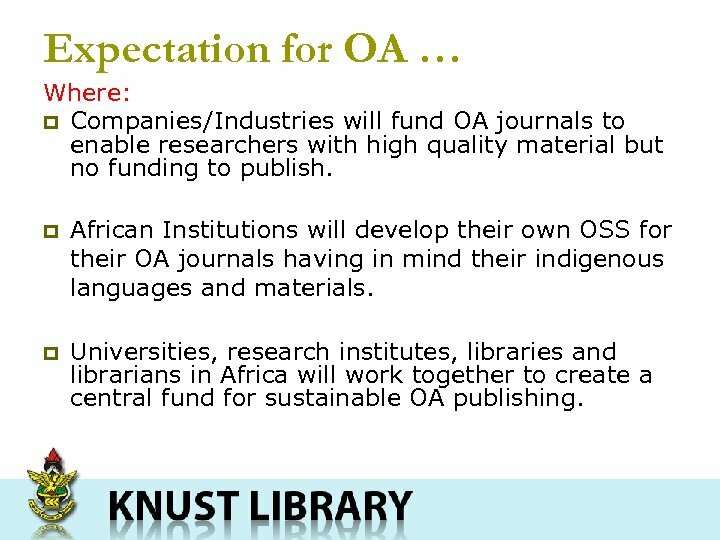 p Universities, research institutes, libraries and librarians in Africa will work together to create a central fund for sustainable OA publishing. Last Words on OA p Several misgivings about OA but it is still alive and growing stronger. p OA ideals laudable especially for developing countries. p OA costs need to be built into research grants. 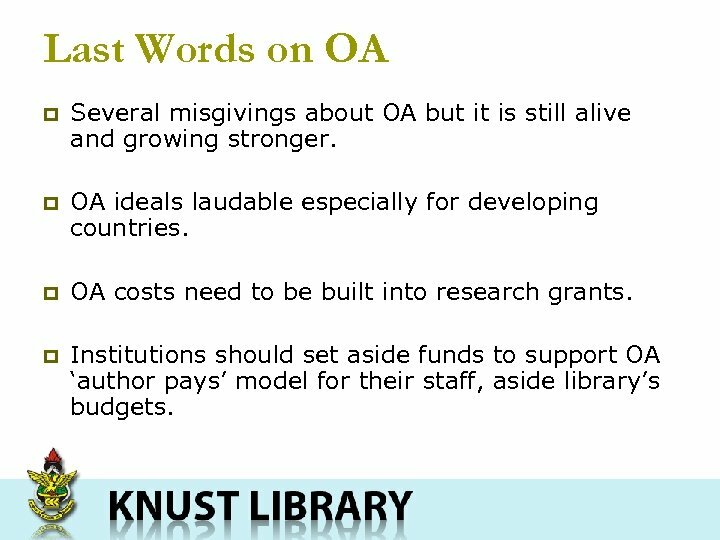 p Institutions should set aside funds to support OA ‘author pays’ model for their staff, aside library’s budgets. Last Words on OA p Institutions should give OA articles more weight as for subscription ones for advancement of their staff. 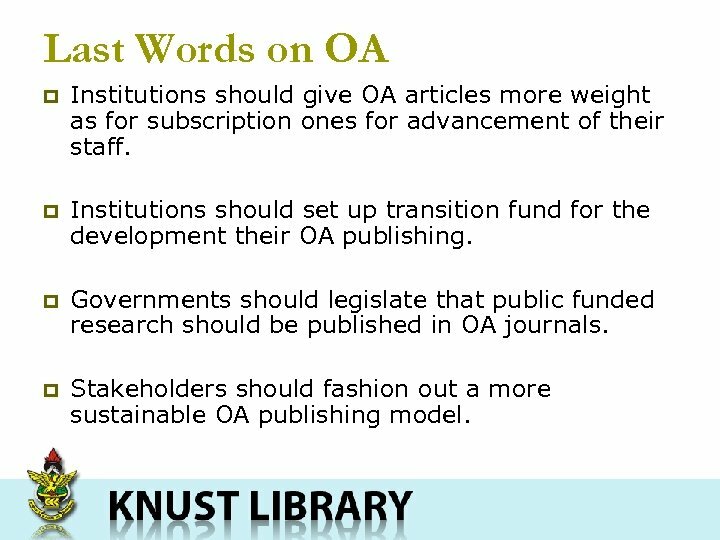 p Institutions should set up transition fund for the development their OA publishing. p Governments should legislate that public funded research should be published in OA journals. p Stakeholders should fashion out a more sustainable OA publishing model. 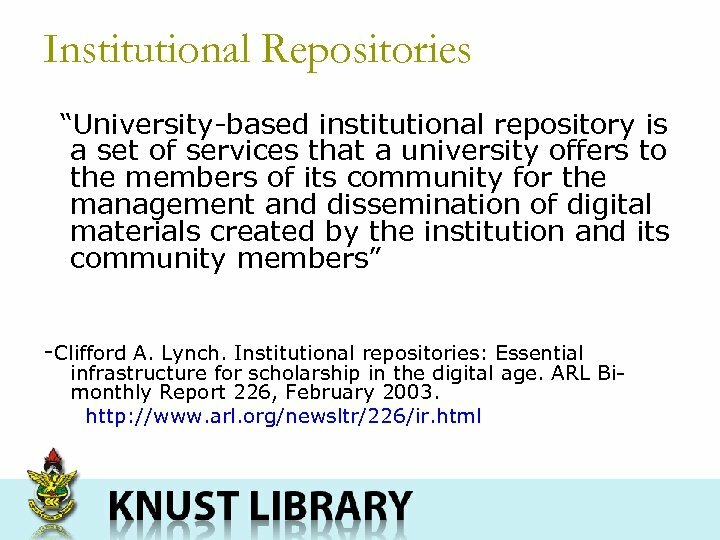 Institutional Repositories p Publicly accessible repository (archive) where all the work published by researchers/authors affiliated with the university/institution can be posted online. p Contributes to the status of the institution by displaying the intellectual output of the institution. 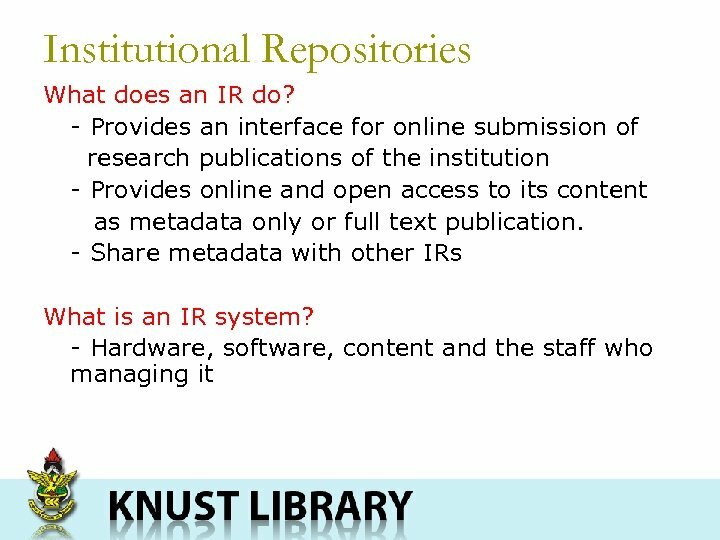 Institutional Repositories What is an IR used for? 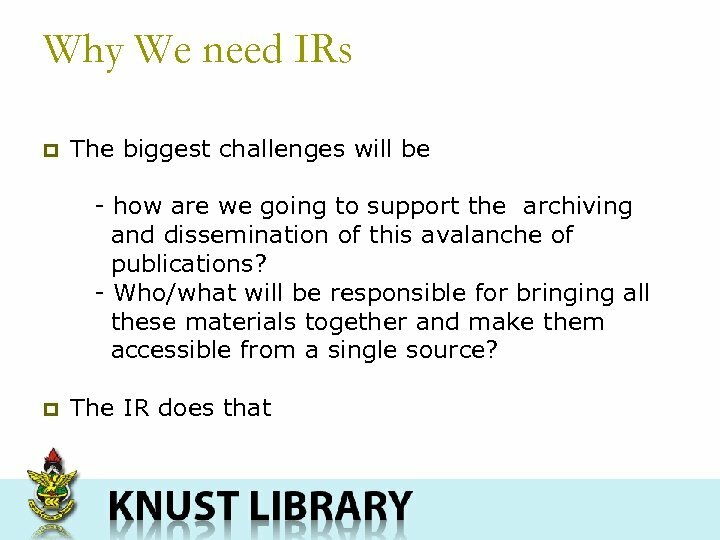 p Long term organisation, preservation, access and distribution of research output of an institution. 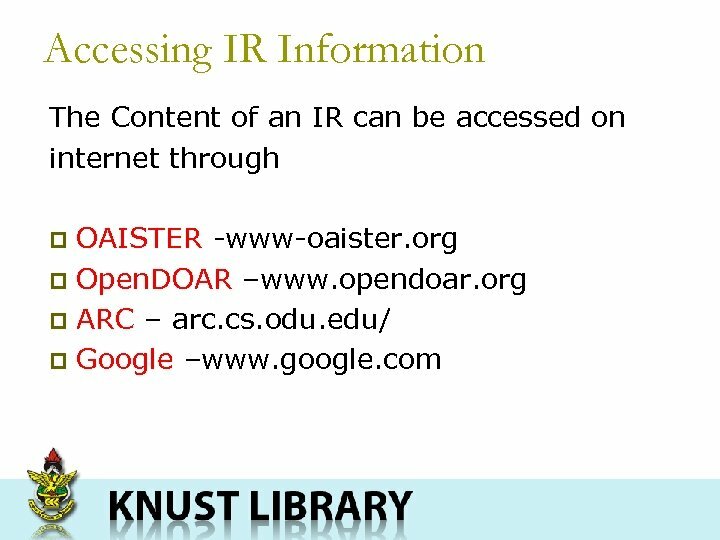 p Enhanced scholarly communication through interoperable open access IRs. 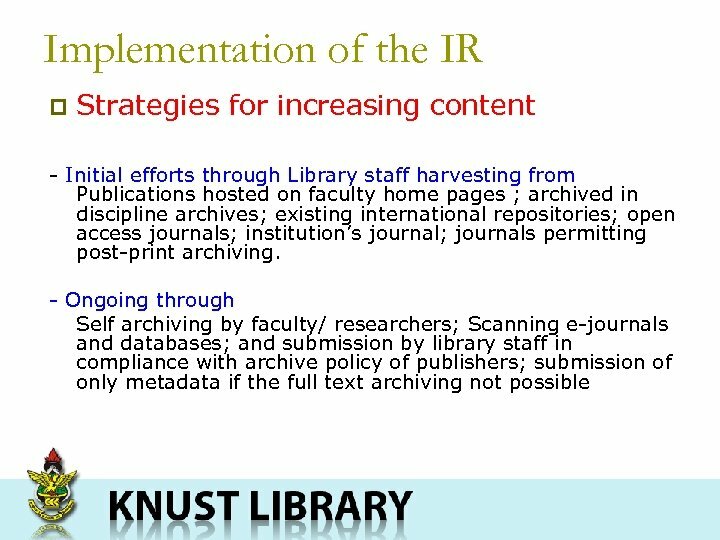 p Improving the management of research knowledge. 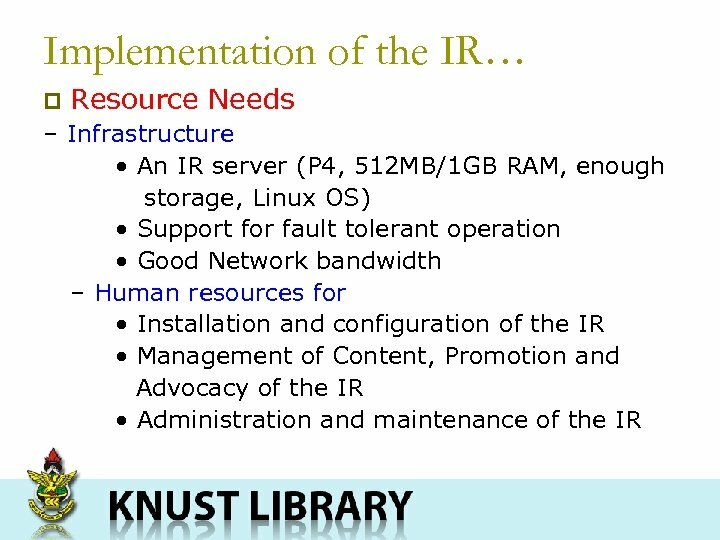 Who may set up an IR? 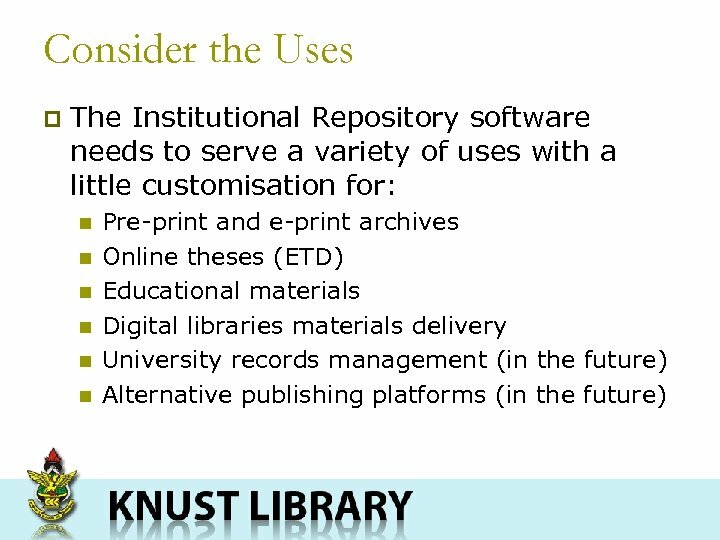 Any institution that is interested in improving the organisation, preservation, access and dissemination of its intellectual assets/output, but currently more emphasis is being placed on institutions of higher learning who produce a lot of scholarly communication. 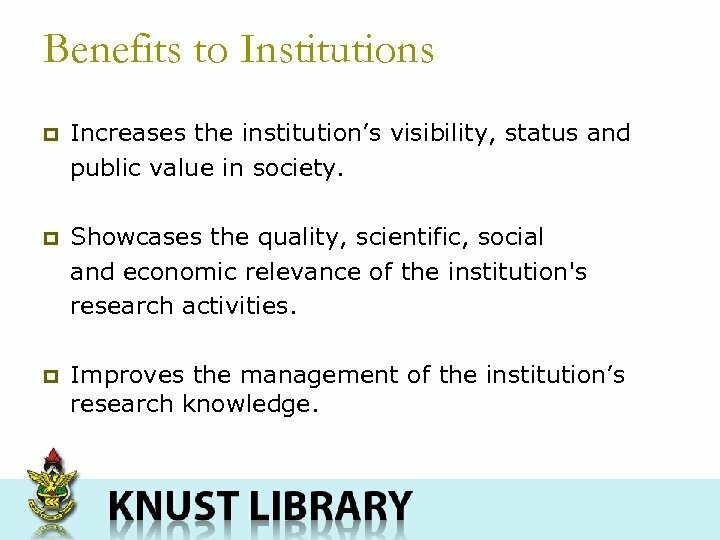 Benefits to Institutions p Increases the institution’s visibility, status and public value in society. p Showcases the quality, scientific, social and economic relevance of the institution's research activities. p Improves the management of the institution’s research knowledge. 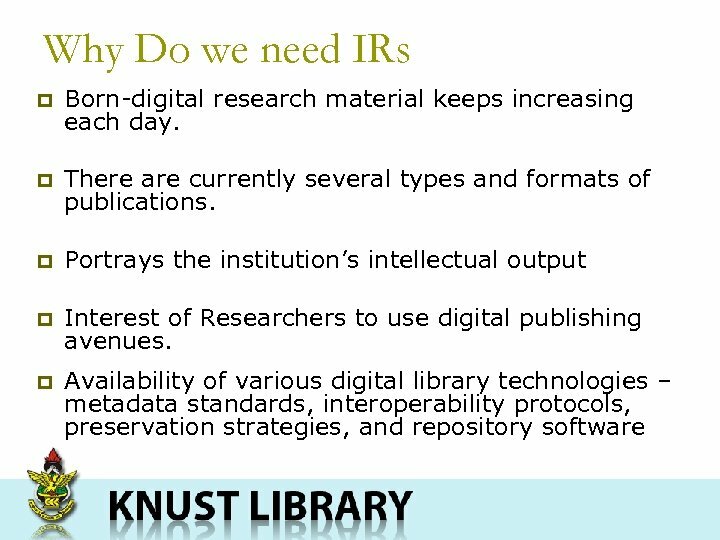 Benefits To Researchers… p Provides assistance to faculty who seek innovative means to give access to their research. p Ensures wider access, visibility and improved impact of their research results p A means for sharing unpublished ideas and knowhow’s among peers globally. p Ensures quick communication and long-term preservation of research output. 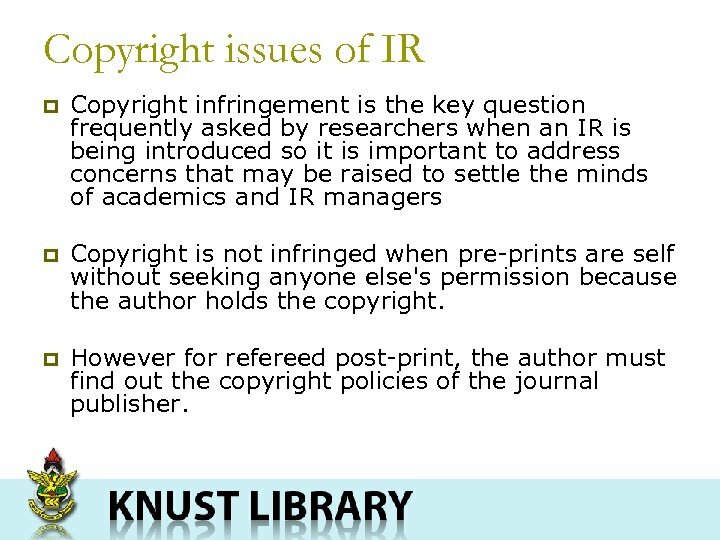 Copyright issues of IR p Copyright infringement is the key question frequently asked by researchers when an IR is being introduced so it is important to address concerns that may be raised to settle the minds of academics and IR managers p Copyright is not infringed when pre-prints are self without seeking anyone else's permission because the author holds the copyright. p However for refereed post-print, the author must find out the copyright policies of the journal publisher. 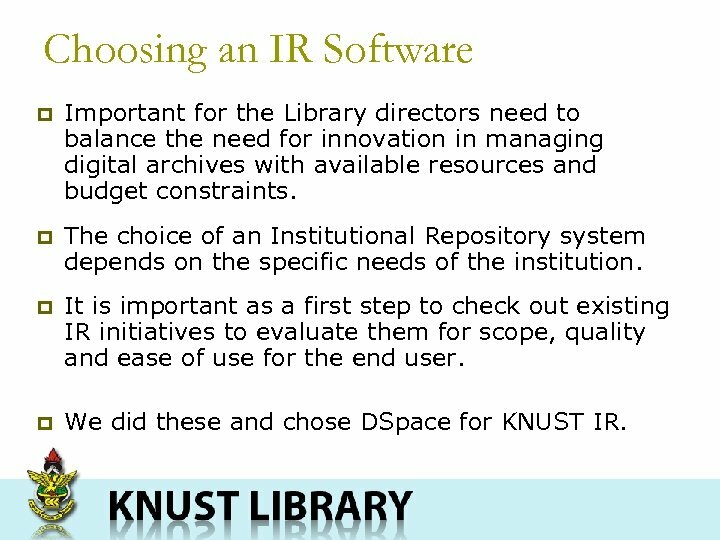 Choosing an IR Software p Important for the Library directors need to balance the need for innovation in managing digital archives with available resources and budget constraints. 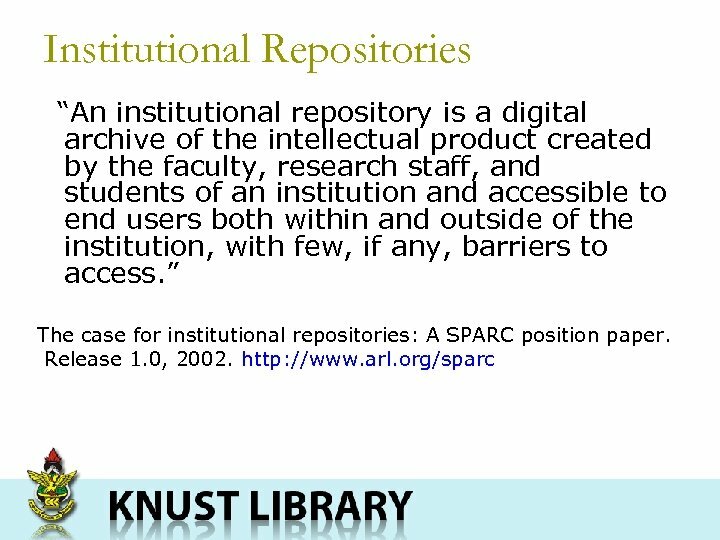 p The choice of an Institutional Repository system depends on the specific needs of the institution. 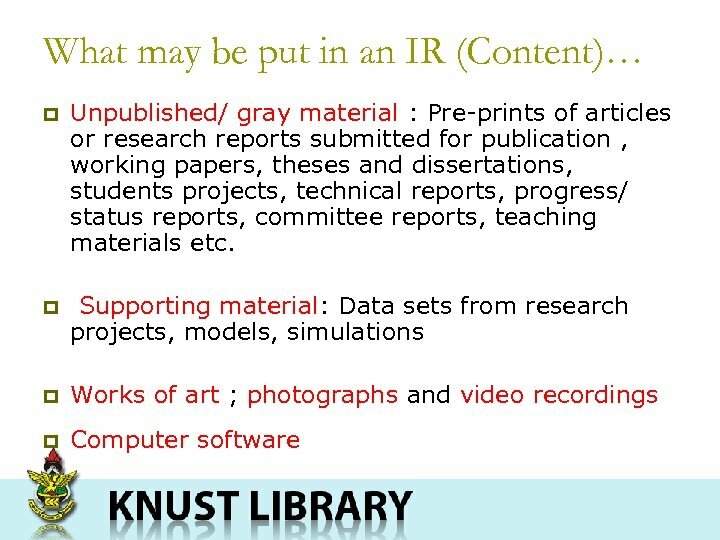 p It is important as a first step to check out existing IR initiatives to evaluate them for scope, quality and ease of use for the end user. 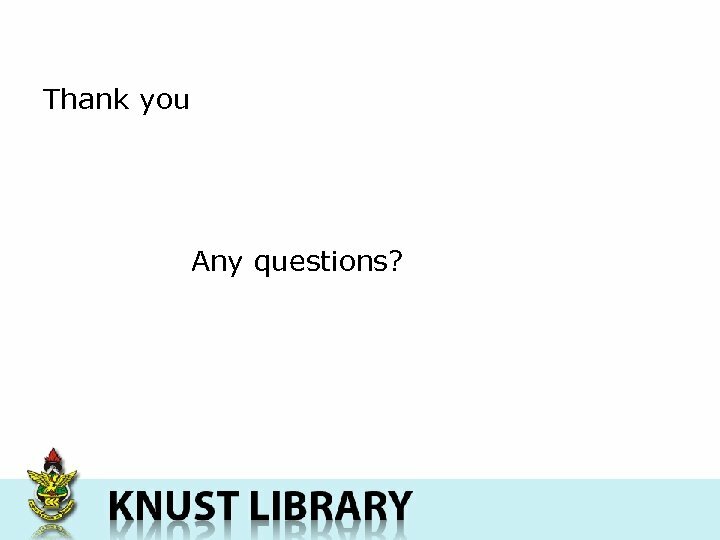 p We did these and chose DSpace for KNUST IR. 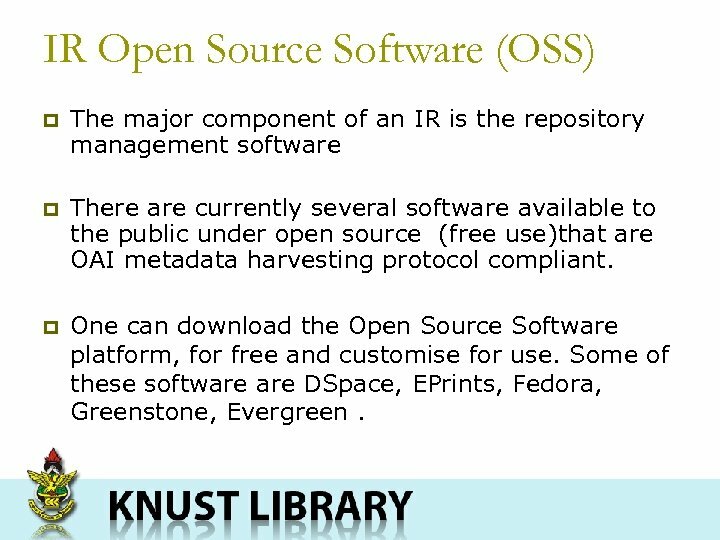 IR Open Source Software (OSS) p The major component of an IR is the repository management software p There are currently several software available to the public under open source (free use)that are OAI metadata harvesting protocol compliant. p One can download the Open Source Software platform, for free and customise for use. Some of these software DSpace, EPrints, Fedora, Greenstone, Evergreen. Advantages of OSS p p p They are for free Already fitted with OAI compliant facility. They have often been already tried by many others. They already have a Community of use that will provide active support. They track research and trends in information management and Internet technology and so carries out revisions. They are mostly made for submission of documents and review and also for archiving. 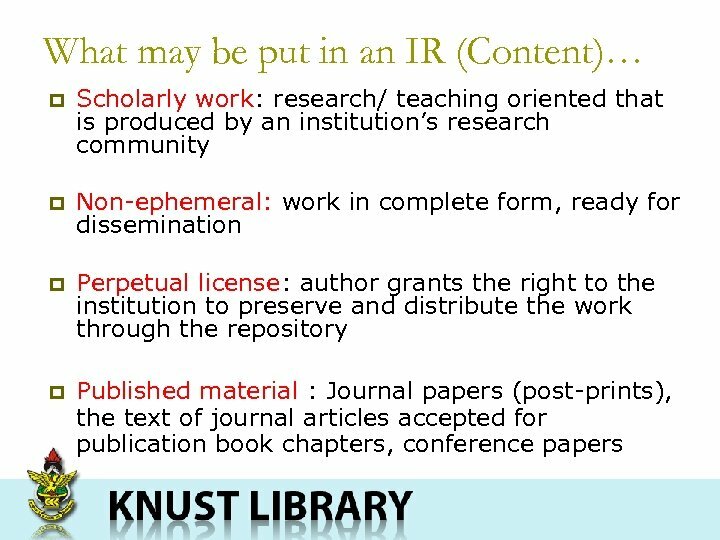 Components of an IR p The important components of an institutional repository should be: n n n An interface that allows for addition of content to the IR. An interface that enables searching/browsing/ and retrieval of content. A database for storing the content. An administrative interface that supports collection management and preservation activities. 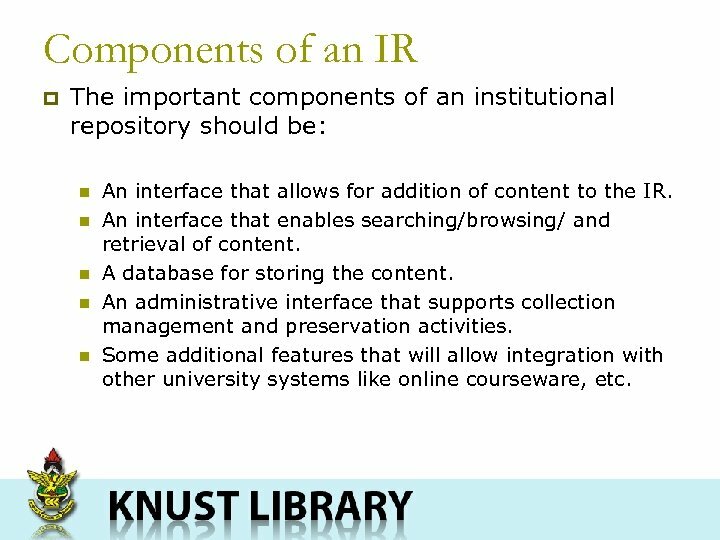 Some additional features that will allow integration with other university systems like online courseware, etc. 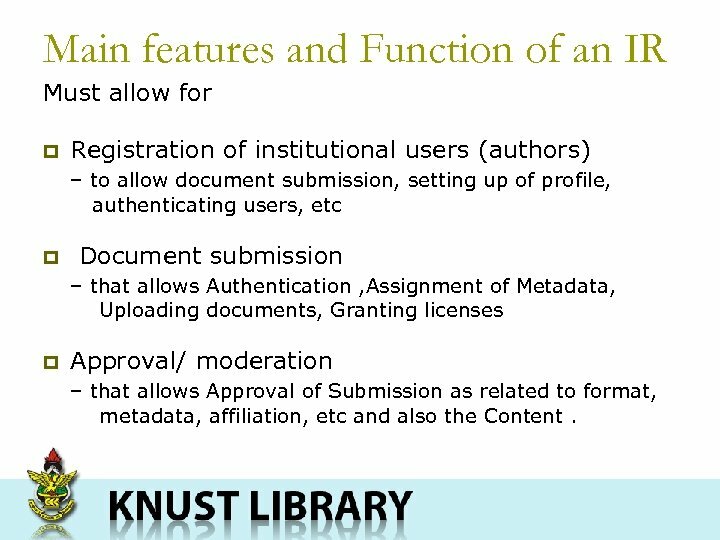 Main features and Function of an IR Must allow for p Registration of institutional users (authors) – to allow document submission, setting up of profile, authenticating users, etc p Document submission – that allows Authentication , Assignment of Metadata, Uploading documents, Granting licenses p Approval/ moderation – that allows Approval of Submission as related to format, metadata, affiliation, etc and also the Content. 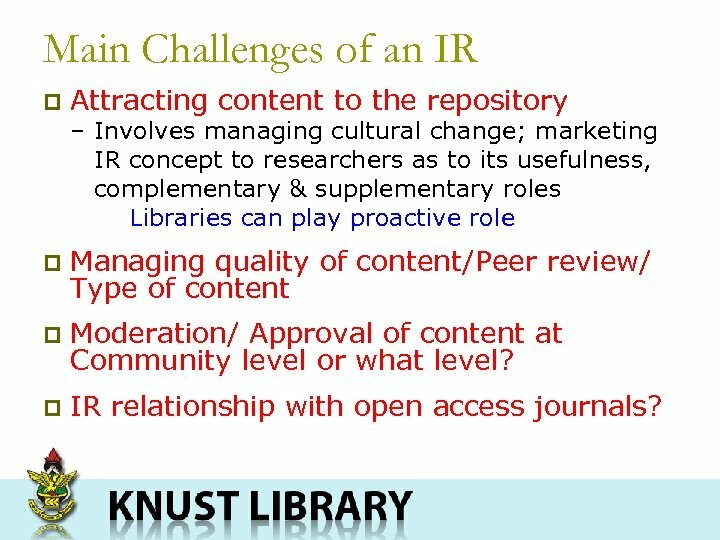 Main Challenges of an IR p Attracting content to the repository – Involves managing cultural change; marketing IR concept to researchers as to its usefulness, complementary & supplementary roles Libraries can play proactive role p Managing quality of content/Peer review/ Type of content p Moderation/ Approval of content at Community level or what level? 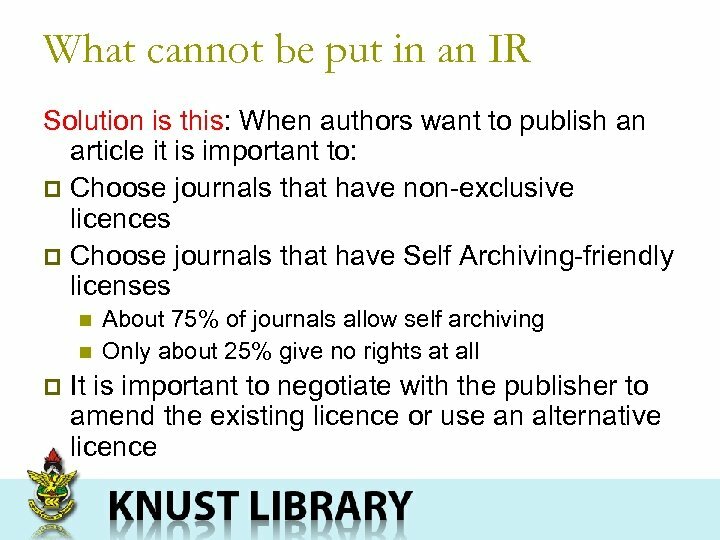 p IR relationship with open access journals? 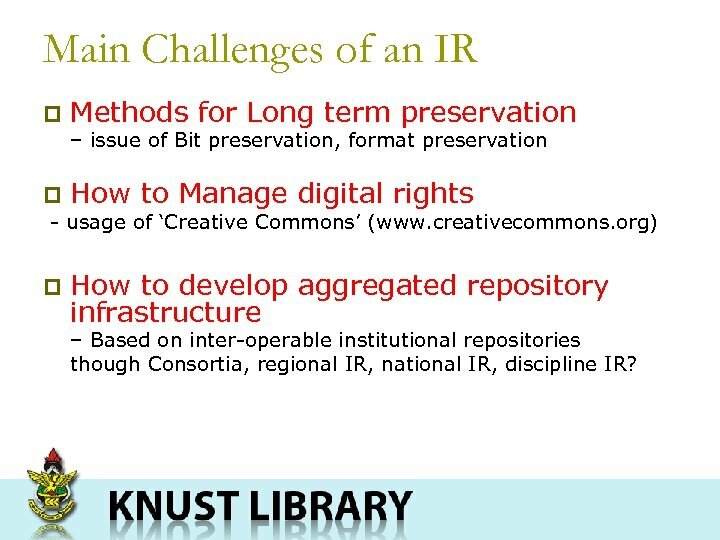 Main Challenges of an IR p Methods for Long term preservation – issue of Bit preservation, format preservation p How to Manage digital rights - usage of ‘Creative Commons’ (www. creativecommons. 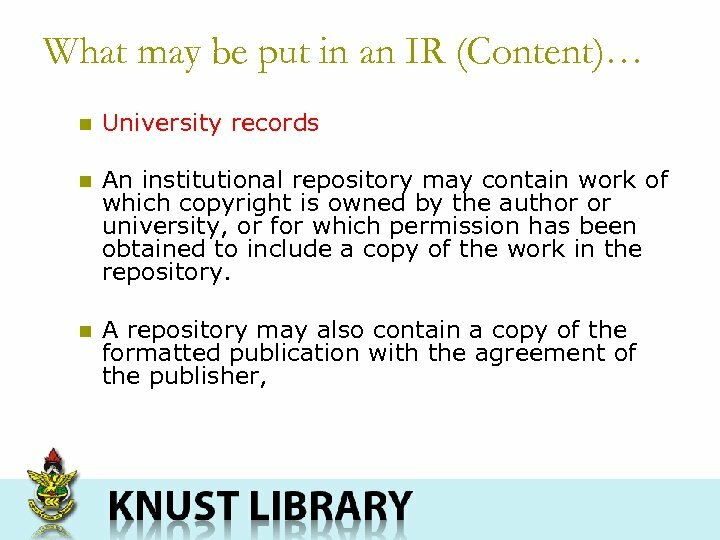 org) p How to develop aggregated repository infrastructure – Based on inter-operable institutional repositories though Consortia, regional IR, national IR, discipline IR? 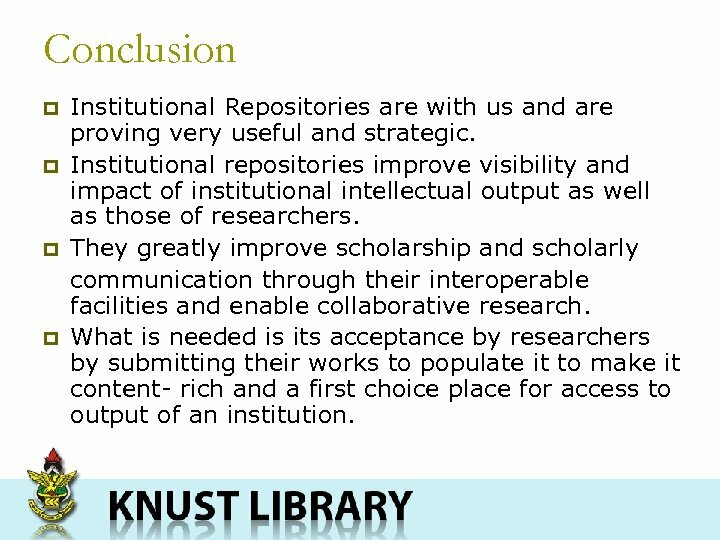 Conclusion p p Institutional Repositories are with us and are proving very useful and strategic. 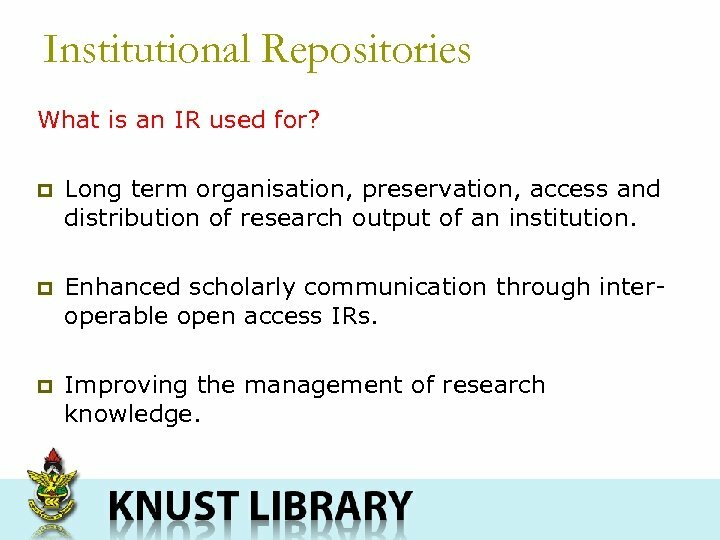 Institutional repositories improve visibility and impact of institutional intellectual output as well as those of researchers. 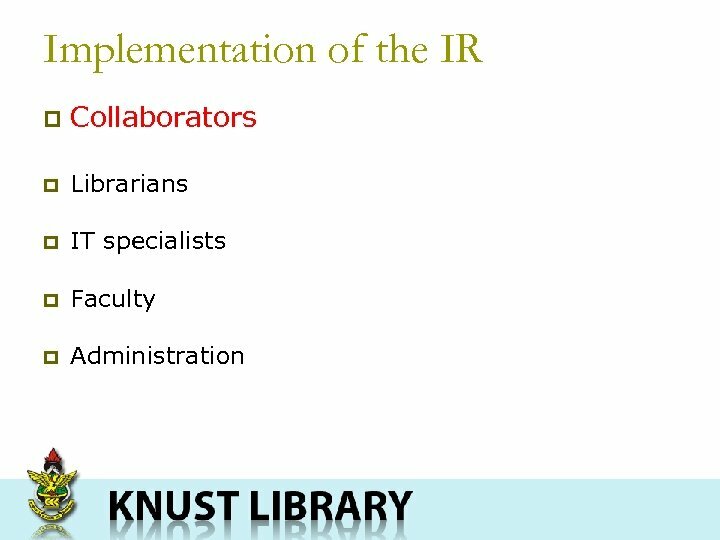 They greatly improve scholarship and scholarly communication through their interoperable facilities and enable collaborative research. 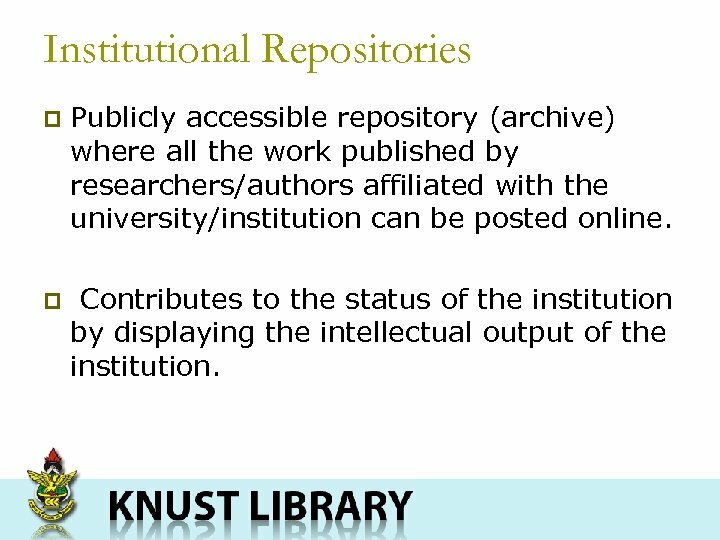 What is needed is its acceptance by researchers by submitting their works to populate it to make it content- rich and a first choice place for access to output of an institution.